While I’m not a huge fan of the Friends minidolls, this one is pretty good. 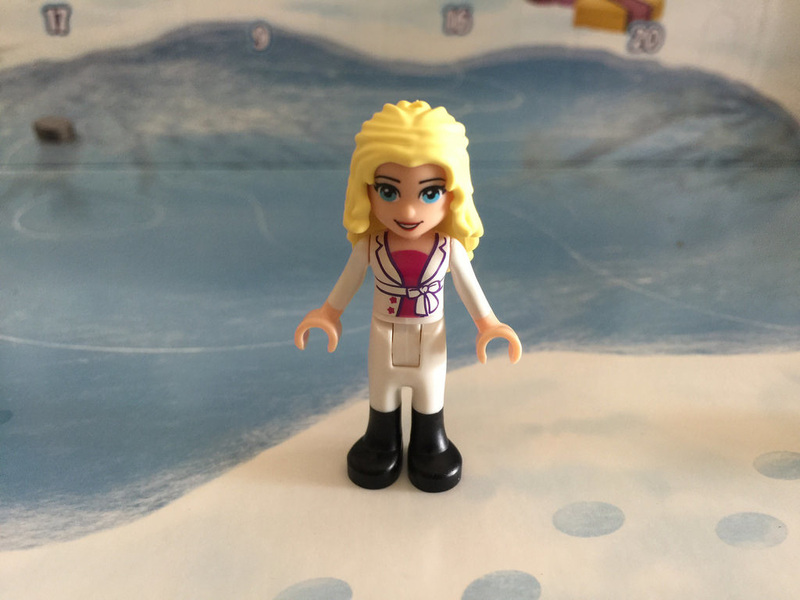 Andrea in this set comes in a Christmas outfit, so can be pretty versatile in other builds. It’s a very simple addition, but a good one. 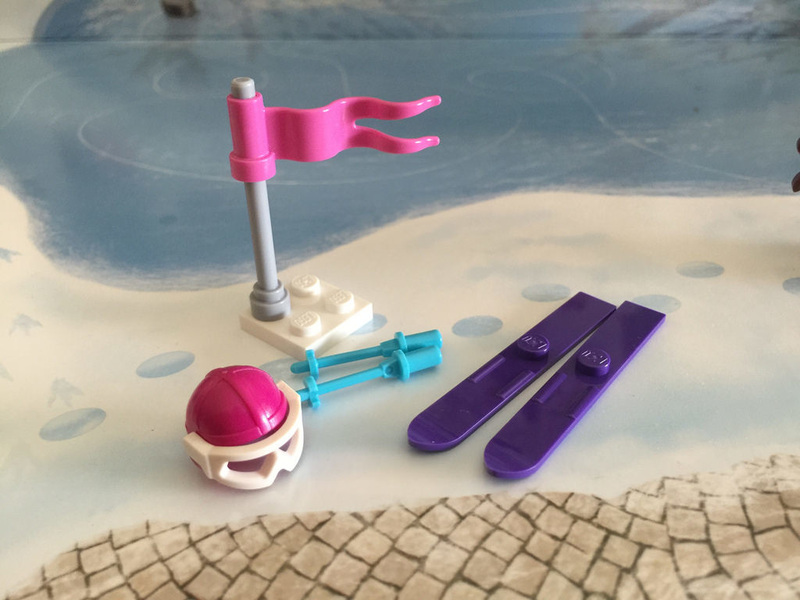 ﻿The second build is a table with some ice-skates. It’s very simple, but I’ve already given the ice-skates to Andrea to wear. They look pretty great. I also recieved a spare skate and flower. We’ve got a sled today. I really like this build. 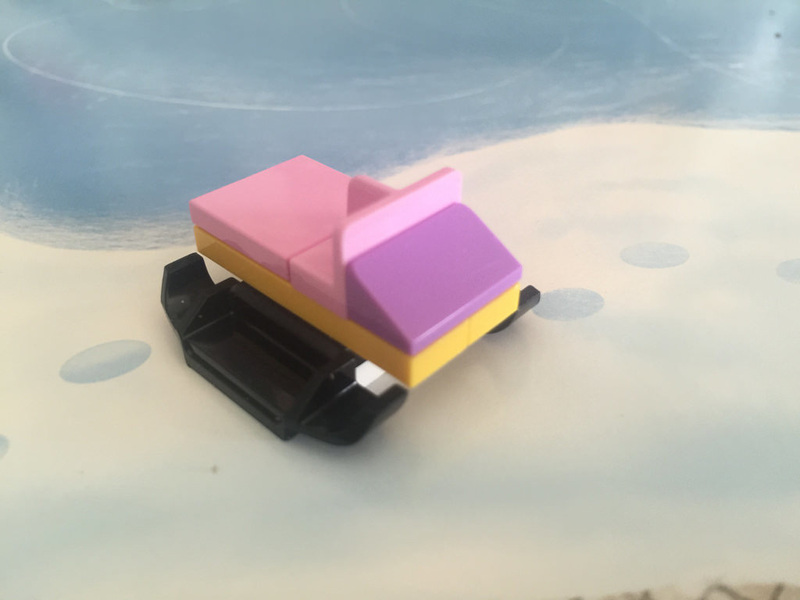 The fact that the minidoll can hold on to the sled using her feet is great, and it looks like a sled well suited for the Friends theme. 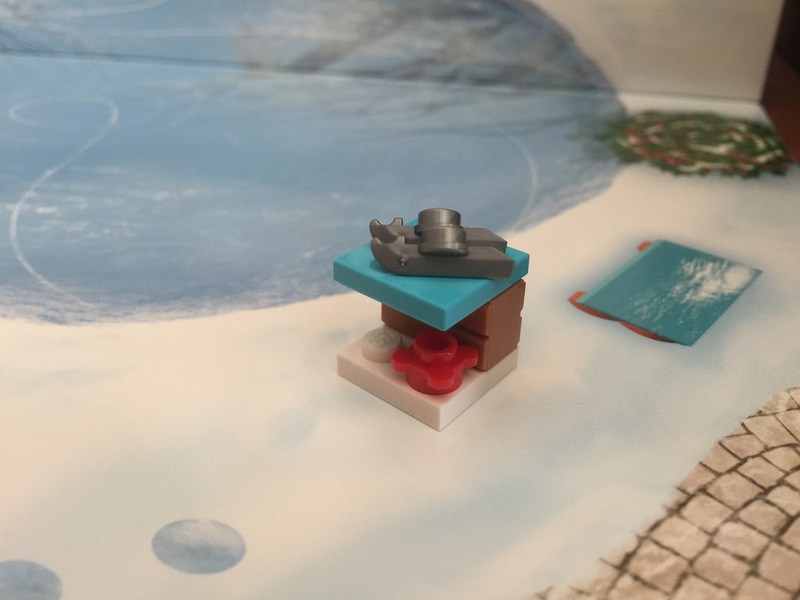 Today we get a little brickbuilt snowman. He looks a little odd, due to the white dish stuck to his front. It just didn’t gel with me, but I like the stick (carrot top) arms, and the top hat. The proportions are a little odd. 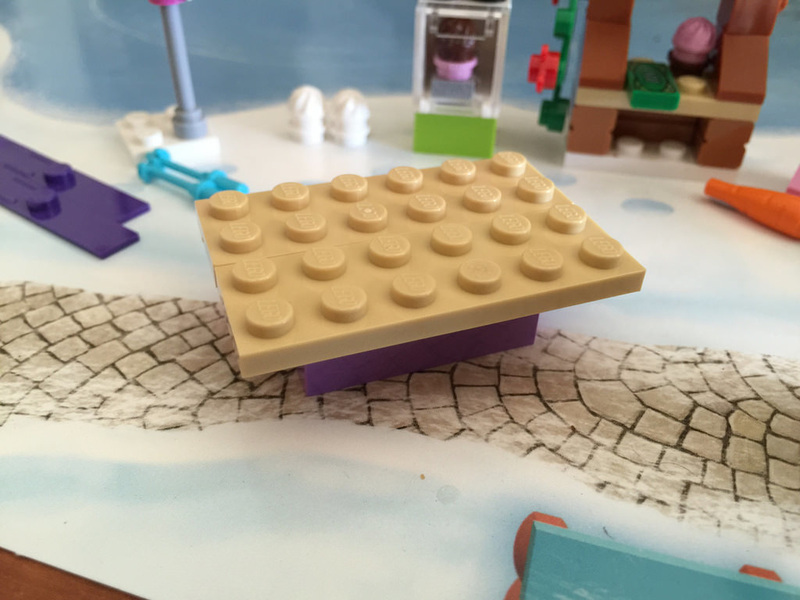 There is a dalek brick (1×1 white brick with studs on all surfaces) behind it. 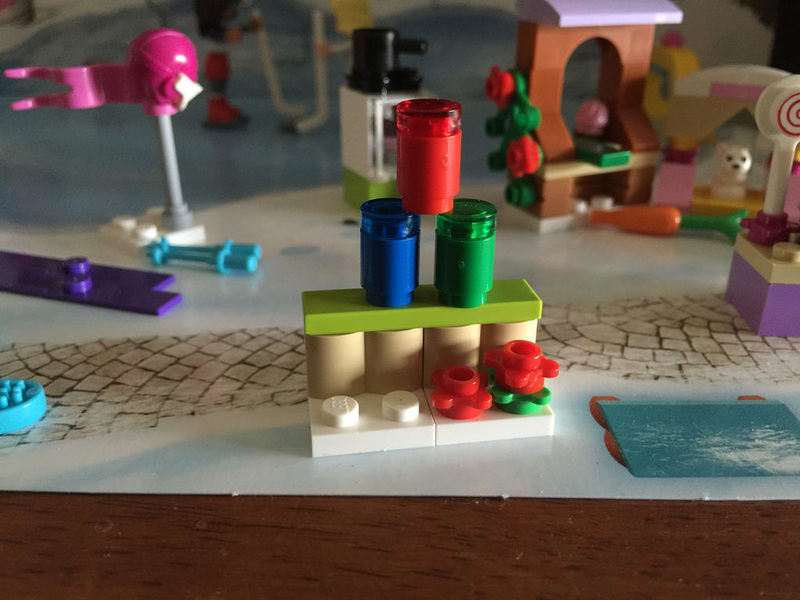 As an improvement, I’d lose the dish and the 1×1 sand plates and just have the flower stuck to the front of the dalek brick. Today we get the second and final minidoll for the set – Liza. She is a pretty good addition, as she’s only appeared in one set before now – 41039: Sunshine Ranch. In this set she’s got a new top, but everything else is the same as her other appearance. If you’re a fan of the Friends minidolls, you’ll want this set for Liza. Today I opened up some ski gear and a flag. This ski equipment looks quite nice. 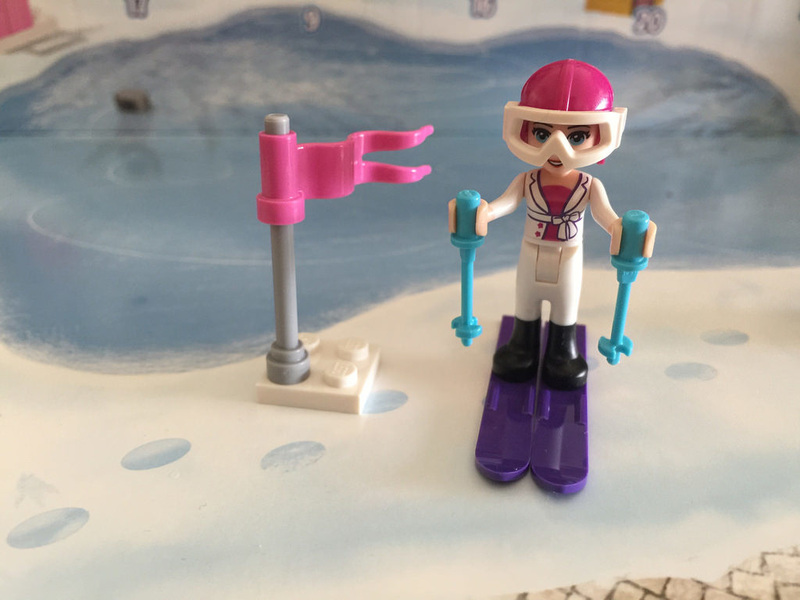 The skis and ski-poles have both been seen in one other set, but never together, while the helmet is actually a flying helmet, with the goggles being seen in a number of sets. I’m not sure about the goggles for Friends sets. They look fine on standard minifigures, but they look ridiculously big on the minidolls. It is nice to have a spare set of goggles and ski-pole though. 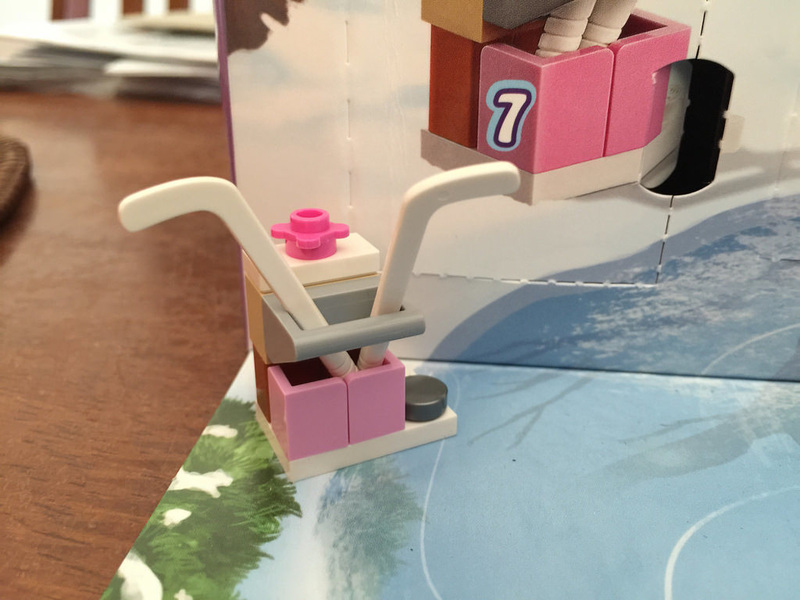 Day 7 is a podium and microphone stand, complete with a little mic. I guess it’s for singing Christmas carols. I like the concept, but the mic stand is overly large. I’m not sure how to combat that, but it’s just weirdly thick for me. The mic itself is a very new element. For the most part, this element is only available in the Pop Stars subtheme of Friends, released in 2015. As an added bonus, you get a spare mic, which is great news. I think the only thing this build is missing is possibly some song sheets (on 2×2 tiles). If that was included, this would be a great build. I also forgot to mention yesterday, there’s a bonus download on a few days in the Friends set! On the back of the box is a little message that says “Unlock new surprises online on the 6th, 13th, 20th and 24th of December!” If you navigate to the Friends website, you’ll be able to download an instruction sheet for the alternate builds for the parts received so far. I think this is a great idea, and makes the set much more interactive. Go LEGO! I won’t spoil the fun – head over to the site and check it out yourself. Of course, with yesterday’s podium and microphone, there needs to be a speaker set, and that’s what we’ve got today. 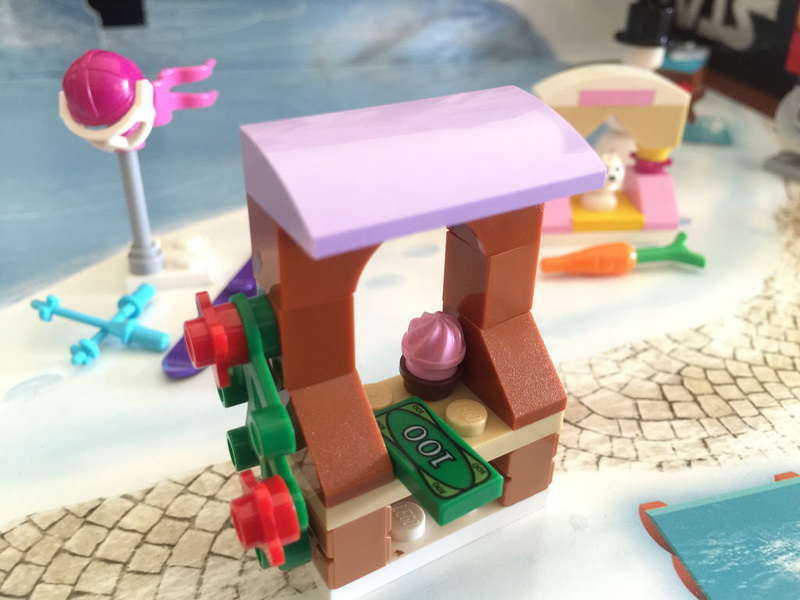 It’s a very simple build, and one regular Friends fans would have seen before, in sets like 41004: Rehearsal Stage, and almost all the 2015 Pop Star subtheme sets. 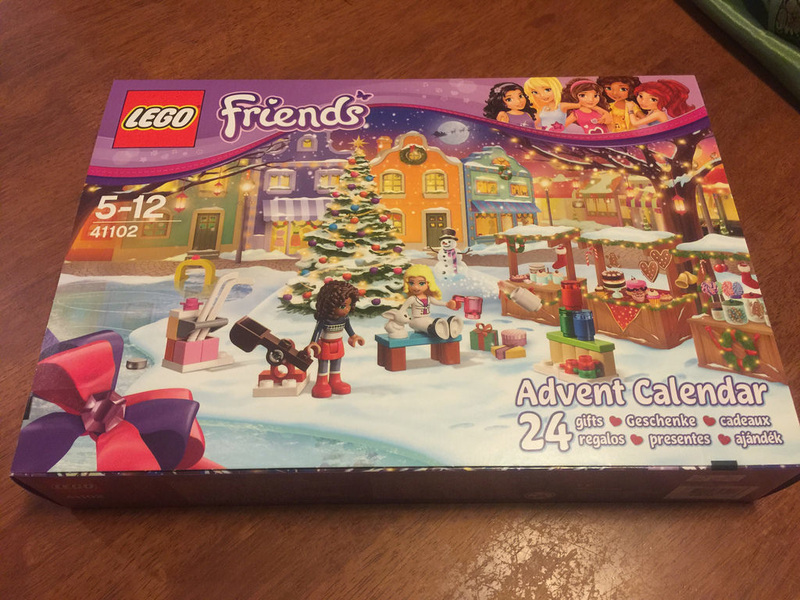 I like the design of it, but I’m not sure it really fits as an Advent Calendar build. Today is another build that I don’t think really suits an Advent Calendar. 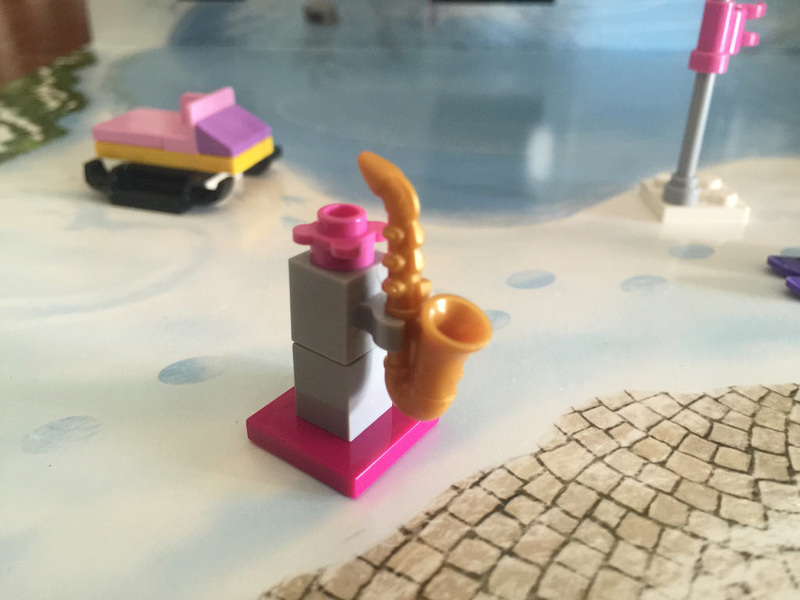 The saxophone stand is very simple, and clearly out of a Friends set, but the saxophone is pretty special. It’s only been seen in 41101: Heartlake Hotel before, so having this is brilliant. It’s just a shame the stand is so dull. 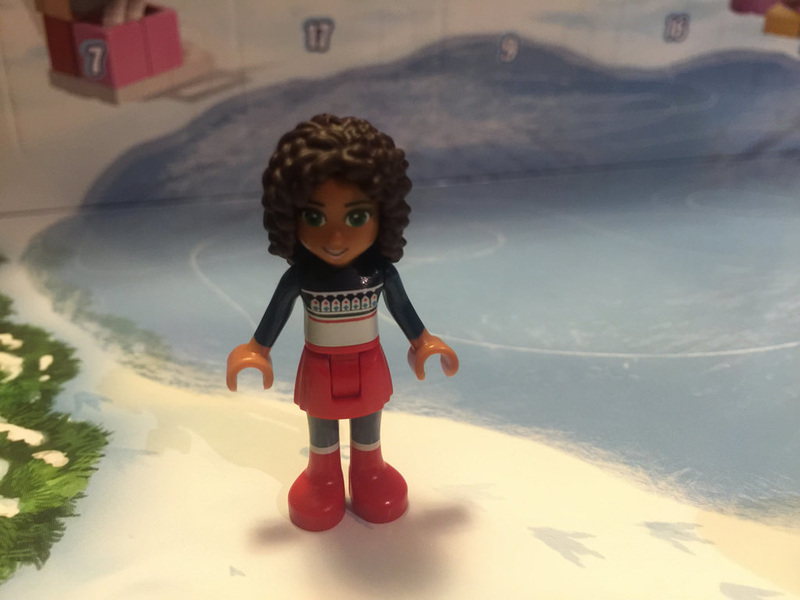 Now, this might seem like an odd choice, but I think the hair accessories inclusion in the Advent Calendar is a smart choice. 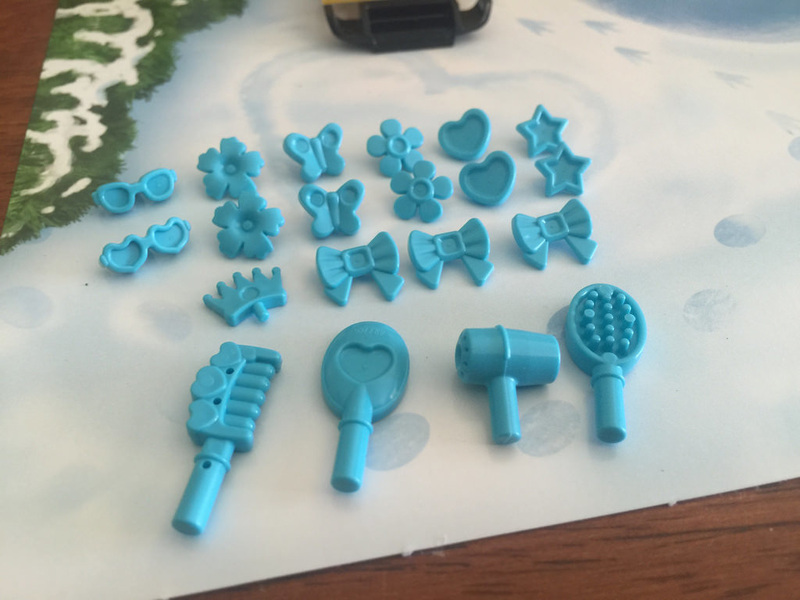 It means that the minidolls are much more versatile, and it’s also only the third time that this whole set of accessories has been in a set. They’re also in 41109: Andrea’s Bedroom, and 41508: Heartlake Shopping Mall, so they haven’t been seen for a while, and belong to Andrea anyway! Liza has a hole for them in the top and back of her hair, while Andrea has one in the top and side, so there’s plenty of uses. Any young girl getting these will think it’s brilliant. 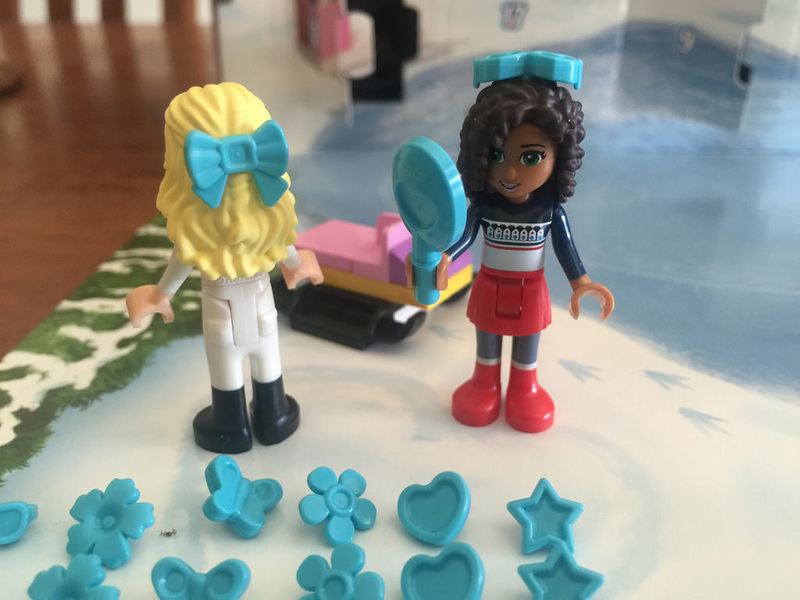 LEGO Friends has done a bit of a repeat in the calendar today, as it continues with yesterday’s theme of clothing accessories. It’s a dress-up box today, with gnome hat (which looks hilariously out of place on the minidolls), a couple of crowns and two pink wands. I don’t see it fitting with the advent theme, but it would be another good fit for Friends. It’s half way, and I’m stumped. I have no idea what the rabbit is sitting in! Is it a house? A box? A puppet show? 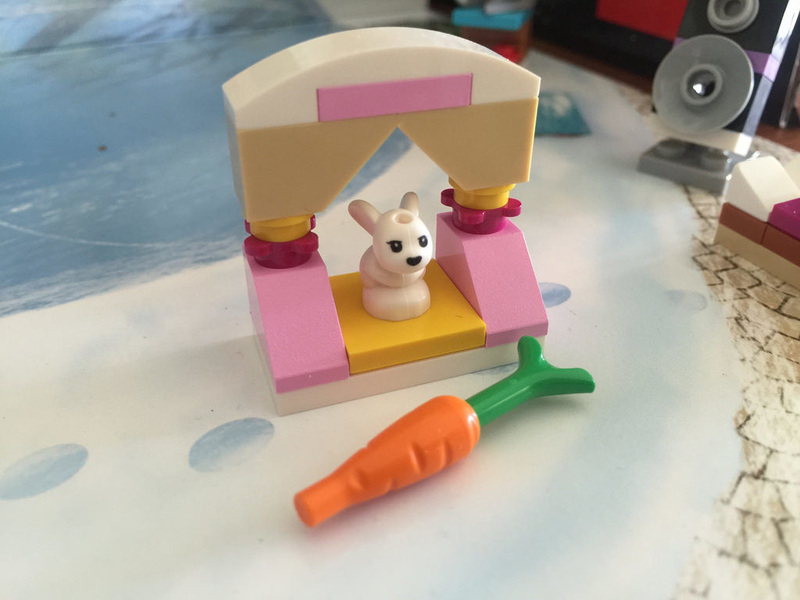 I like the inclusion of the rabbit and carrot, but it doesn’t fit at all with the rest of the set. This may be the worst one yet, purely on what it is, and why it’s included. Day 13 in the Friends Advent Calendar is a cupcake stall. I really like this one. It’s got some nice parts, such as the profile bricks, and that lavender bowed plate on top. It’s only been in five other sets, so a good score. 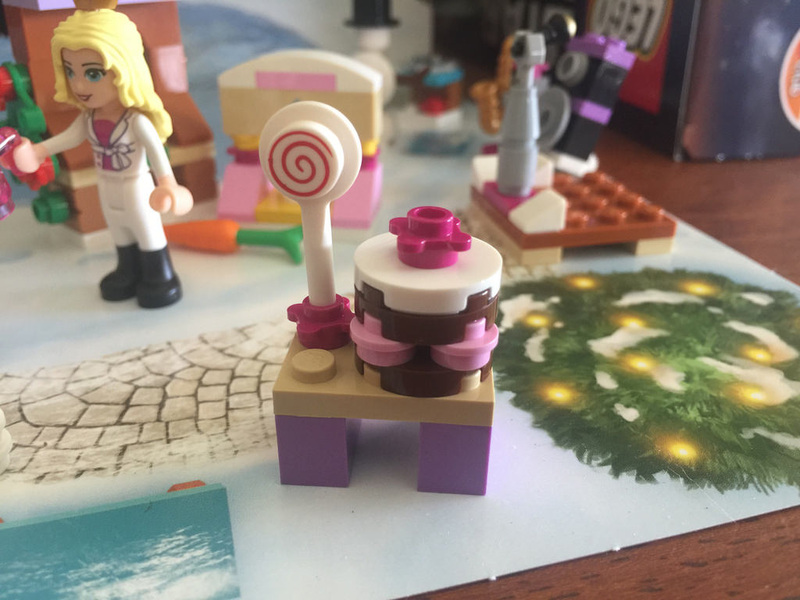 It is a very expensive cupcake though – everything is expensive in LEGO land. 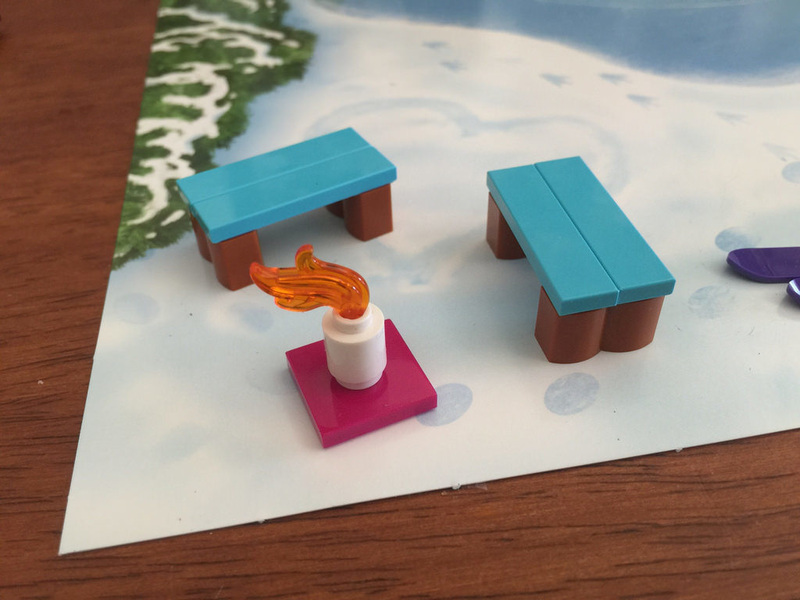 Day 13 also brings us the second alternative build instructions. 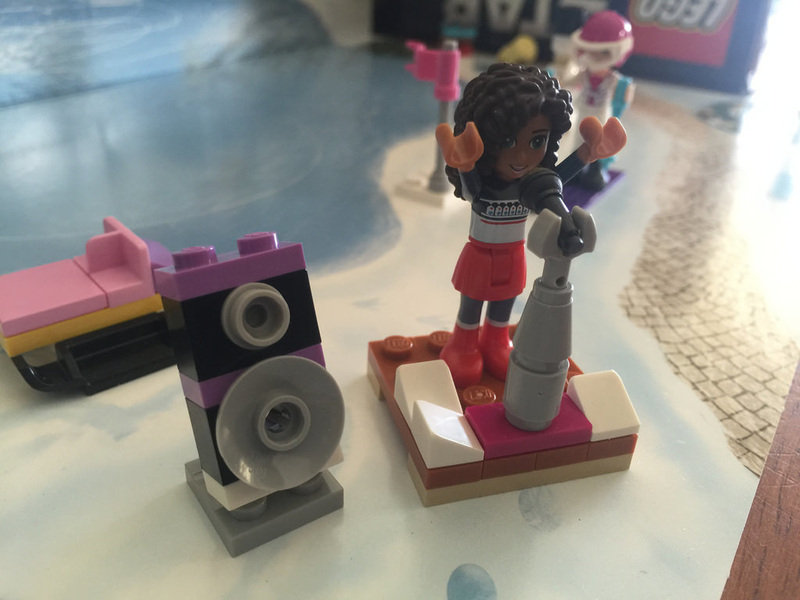 Head to the LEGO Friends website to download them. In keeping with yesterday’s cupcake stall, today we get an oven to bake them in. I like it, but I think they should have used apollo studs (1×1 round plates with holes) instead. It makes ovens look that little bit better. It’s an addition I wasn’t expecting, but makes yesterday’s build a little bit better. Also, it kind of fits with Christmas – everyone eats all the time, so why not cupcakes! While hot chocolate is definitely Christmas (although not so much in Australia! ), today’s build is a little on the lean side. 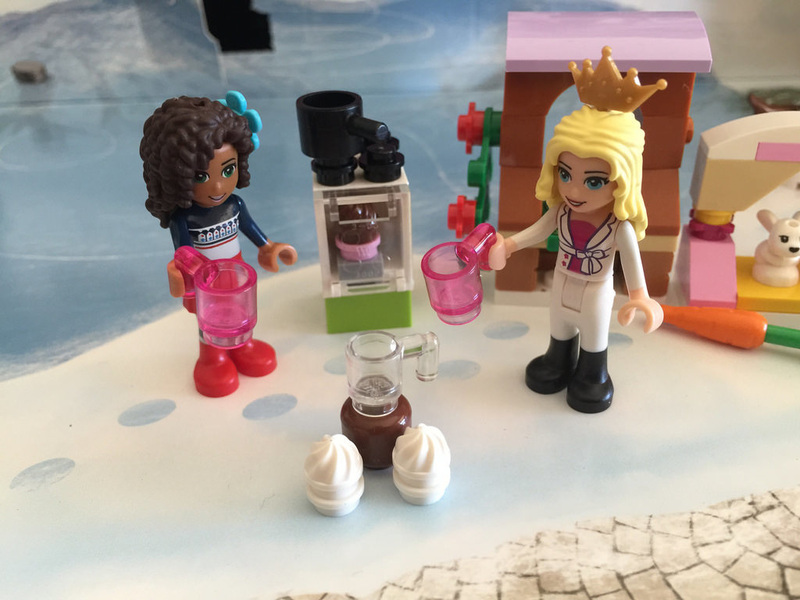 There isn’t much to it, and I understand that the white cup and brown minifigure head is meant to be a jug of hot chocolate, it looks a little weird. It’s also a shame that the cream doesn’t sit that well on the cups. I like the idea, but it’s been poorly executed. The pan is a nice touch, but that’s about it. It’s a cakey kind of day today for Day 16. I really like the look of this cake, and the lollipop is an added bonus. 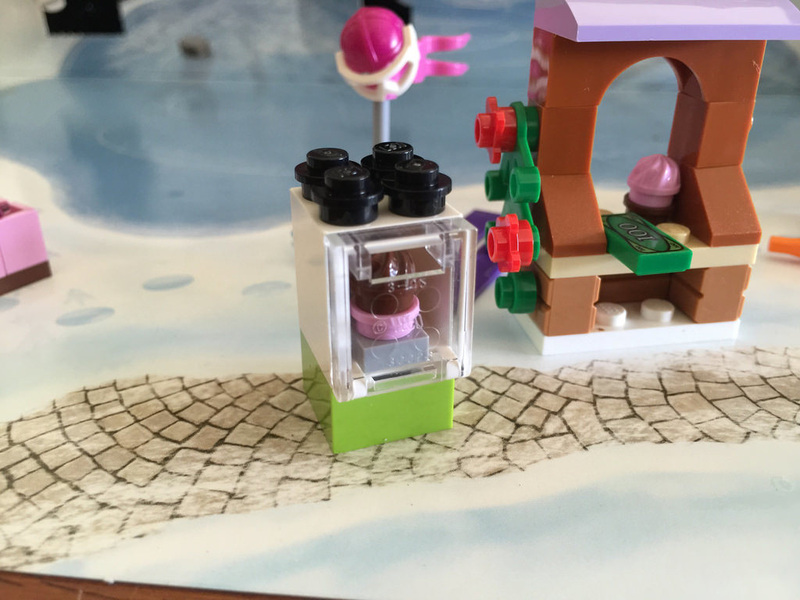 It’s a great looking build, and the 1×1 round printed candy is great, as well as the medium lavender 1×2 bricks. They’re not in many sets, so having them in here is nice. The cake looks pretty tasty too! There’s nothing particularly new about the build behind door number 17, but that doesn’t mean it looks rubbish. On the contrary, it’s simple, but looks pretty good. 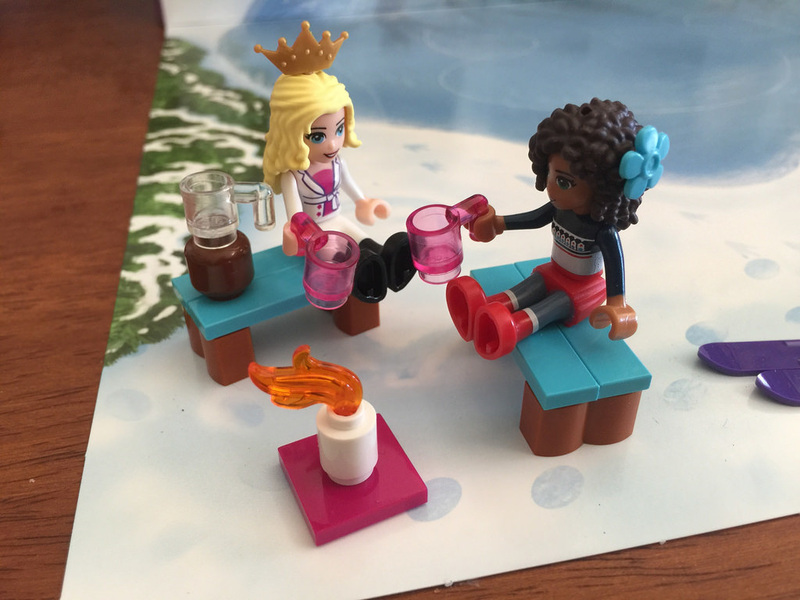 With a simple but effective bench design, and the little fire pot, it’s a pretty nice spot for Liza and Andrea to enjoy their hot chocolate. We’ve also moved away from the food theme of the last few days, so I wonder what’s behind door number 18? Time will tell. 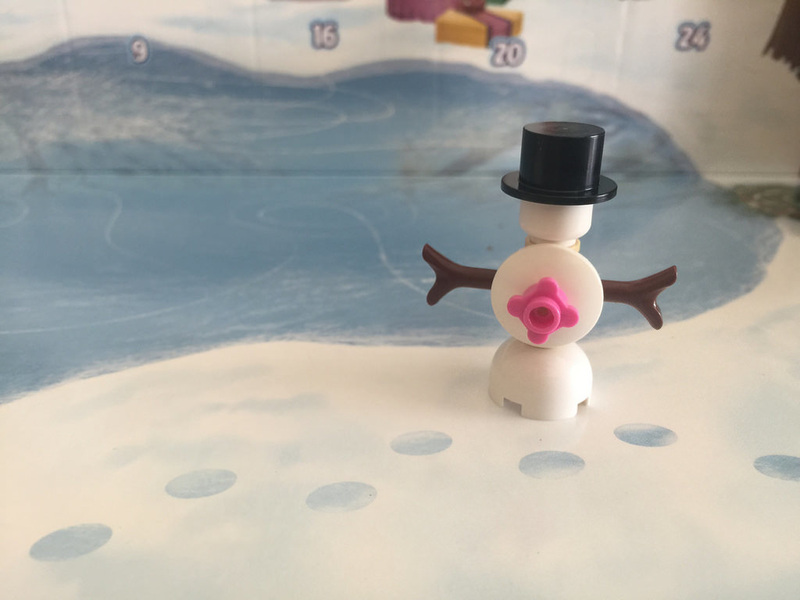 It looks to me like LEGO just didn’t have it in them for Day 18. I mean, this table is pretty poor. A 2×4 brick, a brown 2×4 plate, and two tan 2×6 plates. They could have done so much better with this one. Bitterly disappointed. 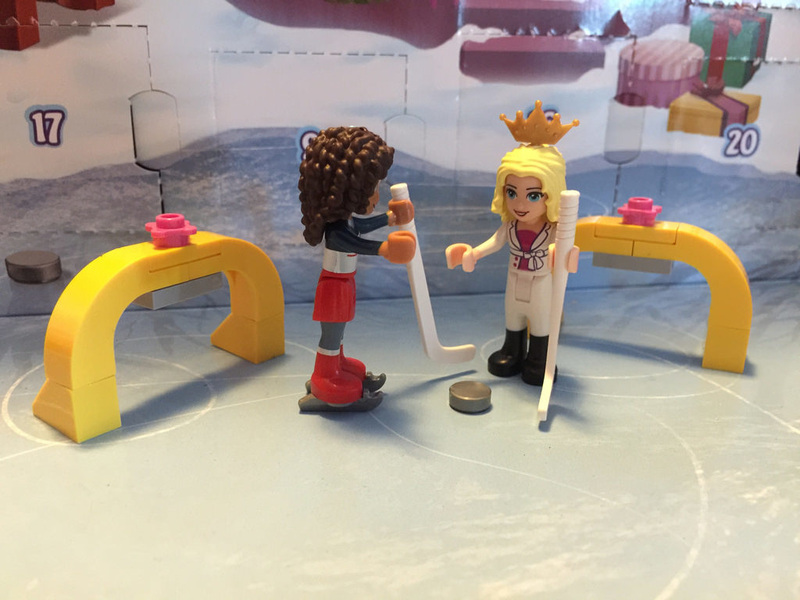 After an absolute shocker yesterday, today LEGO has come back strong, with a great looking ice hockey equipment and rack build. There’s also a puck using a 1×1 round tile. It looks really impressive. Even better is the hockey sticks are brand new! These have never been seen before, so it’s great to get two of them. I’m chuffed! I think they’ve redeemed themselves after yesterday’s disaster. After yesterday’s hockey gear, today we complete it with two very nice goals. They are made up of some nice bright yellow elements, including four of the 1x3x2 brick with bow, that have only been seen in four other sets. It’s great to get so many. All in all, a nice way to round out the hockey gear. It would have been nice to get another pair of skates, but I’ve got plenty. 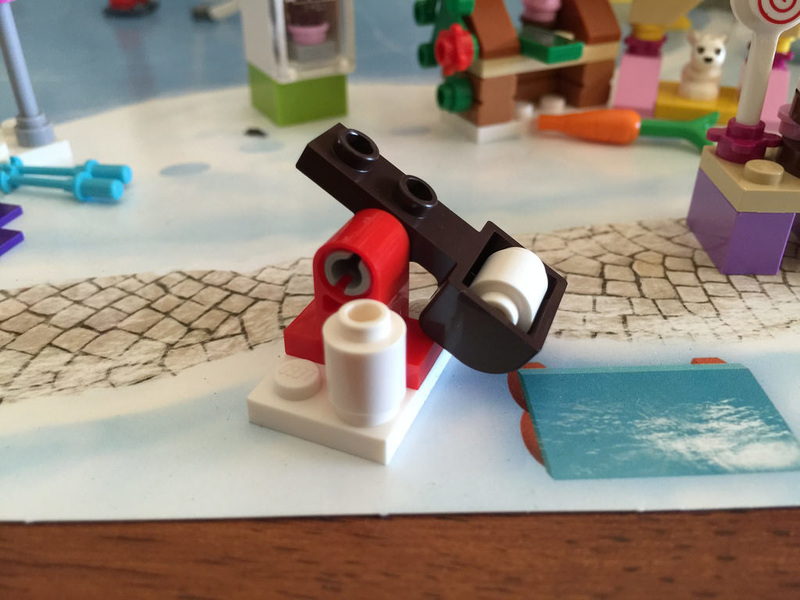 It’s another staple of the Advent Calendar – the snowball catapult. An easy build, and often pretty uninspiring, as it really doesn’t change that much. Nice to have, but to me it doesn’t fit in the Friends theme. I’m not sure why, but it’s out of place to me. It took me a while to figure this one out, but I think it’s a knock ’em down game you get at a fun fair. While it’s a nice looking build, I’m not usually a fan of a build that involves elements sitting loose on something. I like the look of the jars, and the flowers, but as there’s no ball, I don’t see the point so far, unless it’s not what I think it is at all! If you have other theories, let me know in a comment. It’s the second last day today, and this Christmas tree was worth the wait! It’s a little different than the standard build, as this one sits on a round 4×4 white plate, has white slope branches for snow, a 2x2x2 pyramid block at the top, and all topped off with a nice little star. I think this tree is the nicest one I’ve seen, and I love the star at the top! It’s a shame it’s not sitting vertically, but apart from that, this is one of my favourites in the set. It’s beautifully put together, and there is also a lot of parts, at 20. Here it is – the last day in the Advent Calendar, and I like it! It’s a little penguin on an iceberg, and while pretty simple, it is also pretty special. 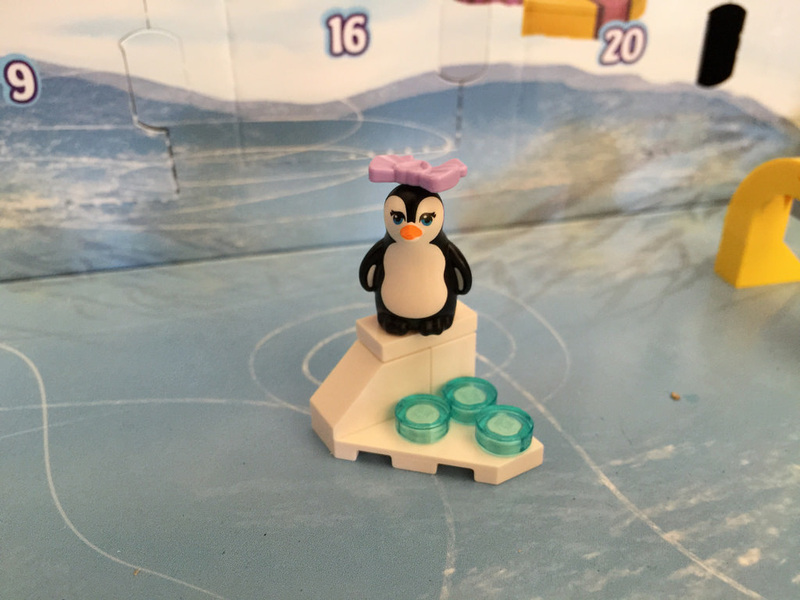 The penguin is only in one other set from 2014, 41043: Penguin’s Playground, so having it appear in this is excellent! 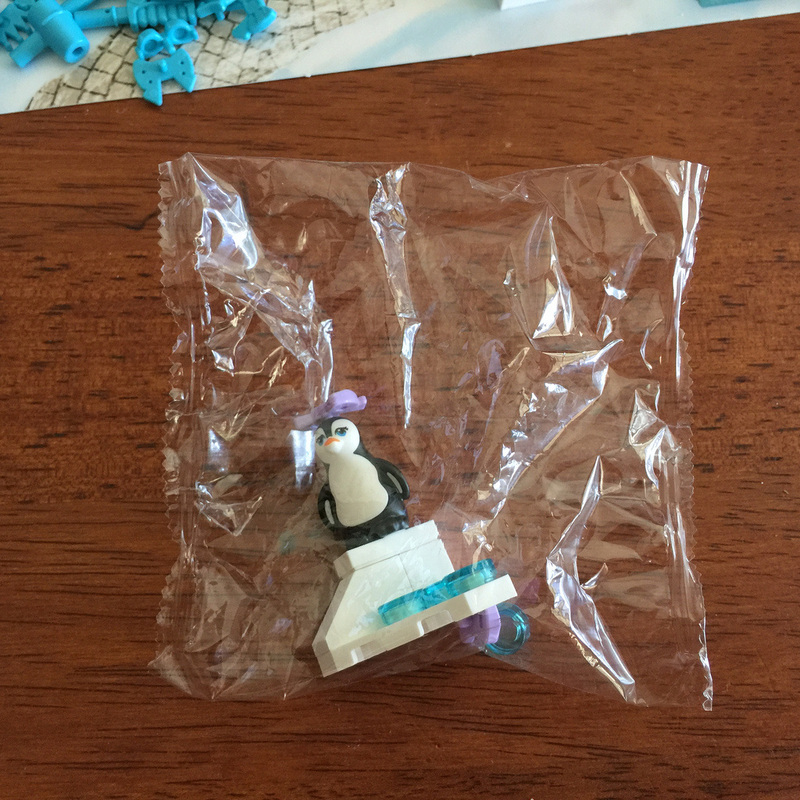 I even found that my wife had done a sneaky build-in-bag for me. I was very impressed! We weren’t sure about the bow as it looked a little out of place, but I’m not going to complain. Another great build! So that’s it! We’ve been through the whole advent season to end up with a pretty full board. It’s had it’s ups and downs, but it has been a blast. 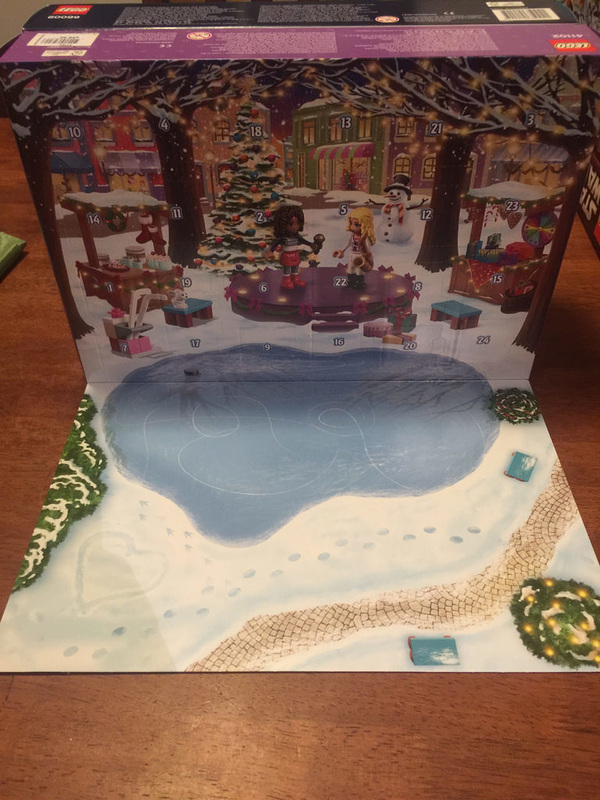 These three (Friends, City and Star Wars) are my first proper experiences with LEGO Advent Calendars, and I have to say, it was fantastic! I’m very excited about next year. Because I’ve covered my usual review process in many of the daily posts throughout December, I’ll be outlining the best and worst days in my opinion, and also give a final score. ​The best day is pretty tricky. 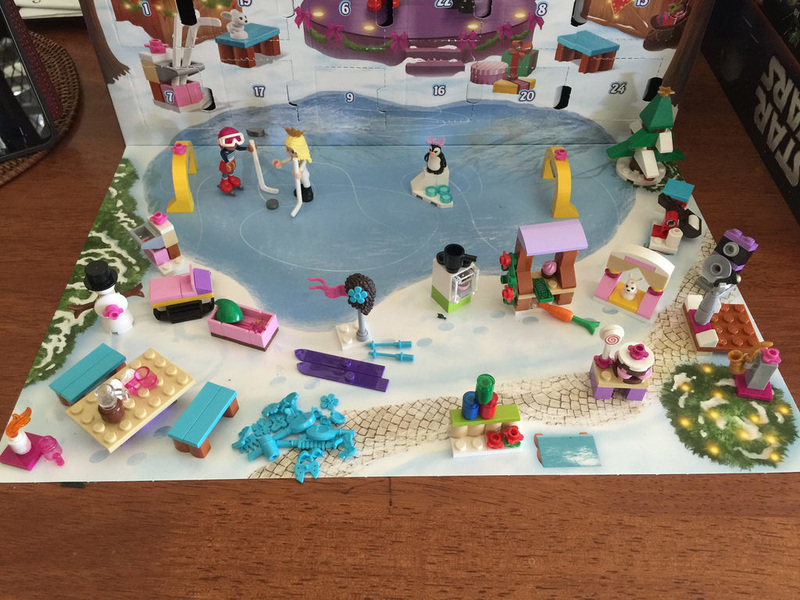 There are three that I particularly like – Day 19’s Hockey gear, Day 23’s Christmas Tree, and today’s Penguin. They all have great elements, are clever, and look great. They’re also appropriate for the set and the season. If I absolutely had to choose one though, I’d go with the hockey gear. It’s a brilliant bunch of parts, and is also very versatile, as other minifigs can get into the fun too. Easy one! Day 18’s Table. It was unimaginative, far too simple, and disappointing. 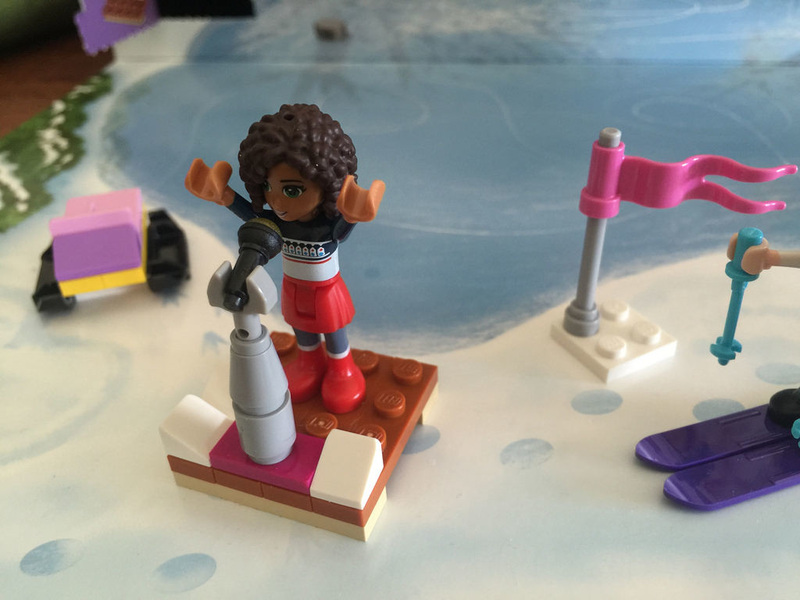 There is plenty to swoosh around, with the hockey gear, sled, skis, snowball launcher, as well as the hair accessories, hot chocolate, can stack, and the stage. Plenty to keep everyone entertained. Some are great to build, others are very simple. It’s aimed at kids, so they need to be simple enough to allow them to do it by themselves. From an adult’s perspective it’s very simple, but that’s not the point. They look great together, but many are just not Christmas to me. The stage especially seemed like a strange addition – it’s a tenuous link to the Pop-Star sets. For $50 you get quite a lot, and a long, drawn out build process is extremely enjoyable. There are only three a year, so well worth collecting! Did the set live up to your expectations? Was it worth the $50? Most importantly, did you have fun? I certainly did! Merry Christmas everyone, it’s been a fun month! Do you still have the instructions to unlock the surprises on day 20 and day 24? 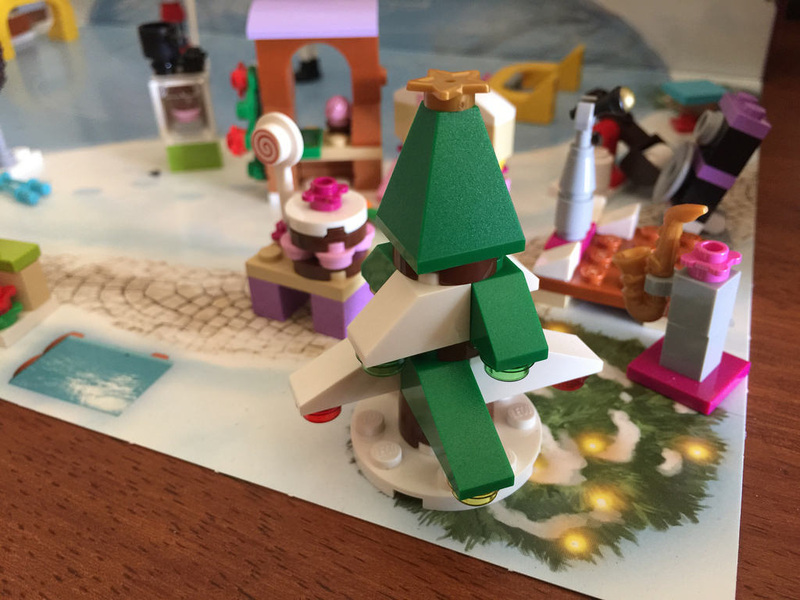 LEGO website only has links to surprise day 6 and day 13. 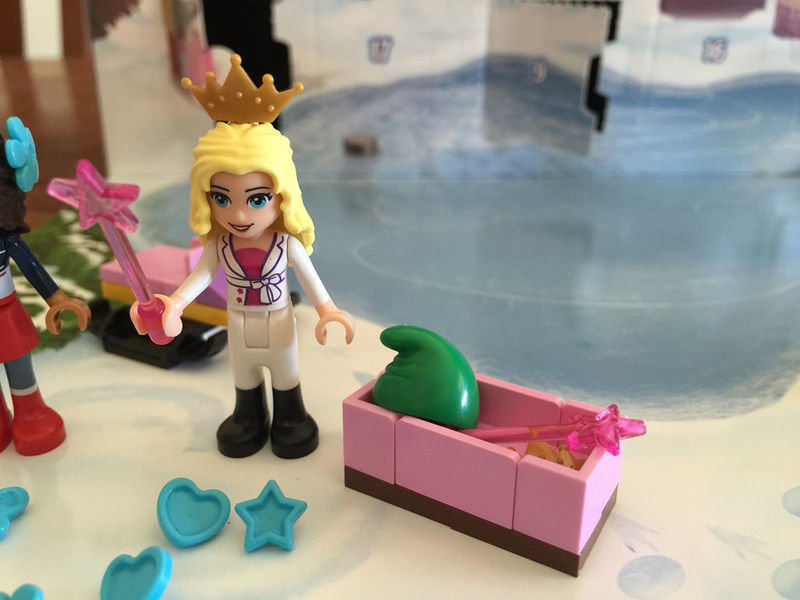 I contacted LEGO who advised there were only 2 surprises in 2015, Not true! If you can help My girls would really appreciate it. As this is a set from a number of years ago, I’d say the website has removed the information, so it’s not available. If LEGO Support is unable to help, I’m afraid that’s it!